A World Resource Book of 33 Australian Aboriginal Tales from the Dreaming, told by Pauline E McLeod and June E Barker, and Francis Firebrace Jones, and gathered and assembled by Helen F McKay. Read the overview of Australia, containing the geography – from an Aboriginal perspective. Understand more of the Aboriginal people, their customs – such as the totemic system – and the Aboriginal art forms of art, music and dance. Journey into the Dreamtime, with authentic stories, told by three Aboriginal storyteller custodians. Through these stories from the Dreamtime – the mystical period of Aboriginal beginning – learn about Aboriginal belief systems, moral behaviour, customs and values, survival, hunting and gathering skills, and animal psychology. Discover: Why the Kookaburra Laughs, How the Birds got Their Colours and How the Emu Lost its Wings. Read the stories of: The First Platypus, How the Kangaroo Got Her Pouch and The Beginning Island – a Creation story from the First time, when Tasmania was born. There’s even a space story: The Min Min Light from Northwestern New South Wales! Familiarise yourself with the thirty-three fascinating stories of the Australian Aboriginal Dreamtime, included in this book. Read them often to your children. This collection of Aboriginal stories, can be enjoyed by people of all ages, and at all levels of understanding. 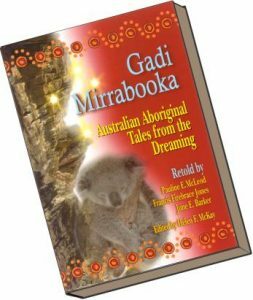 Dr Margaret Read MacDonald, an Author, Storyteller and Folklorist, based in Kirkland, Washington, says of Gadi Mirrabooka : ‘At last we have a collection of Aboriginal tales, we may use with the blessing of the elders. An amazing book ‒ and a great resource. You did a great service to the world, by preserving those wonderful Aboriginal stories and making them available to a wider audience in your book, Gadi Mirrabooka.